Solutions for your home, home office, and small business . . . Your Local Choice for Mac OS®, Windows and iOS® Support on the Florida Emerald Coast. JWDTECH comes to your home, home office, and small business. Forget about needing to lug your computer across town, or even all the way to Jacksonville, only to find out that the real problem was with your Internet provider. 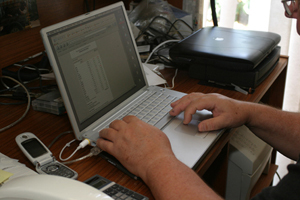 JWDTECH will come to you to provide the in-home / on-site service and support you need. Have you backed up your important data recently? This week? This month? Since the last hurricane season? Have a misbehaving Windows system? Spyware? Adware? Crashing? Have a new iPod®, but don't have the time to load your large CD collection onto your PC to really use it? Have a new iPod Touch, iPhone, or iPad, and want to get the most out of it? Considering buying one and have questions? Have a new AppleTV and want to learn how to use it and get more out of it? Have you heard people talking about "cord-cutting"? Are you wondering if it may be an option for you? Are you considering a new computer purchase? Upgrading old equipment? Trying to squeeze one last year out of a computer that you hope can last? Have you read about Intel’s new processors and wondered “But how does that affect me?” Are you on the fence between yet another Windows purchase and looking for an alternative? Wondering what your options really are? The computer industry is moving faster and faster all the time. Macs now run on the same Intel chips as Dell’s PCs, and can even run Windows if you have that one program that requires the Windows operating system. Intel has recently released an entirely new line of processors that are both faster and in some cases more energy efficient. The computer industry will be selling PCs with these new chips besides PCs with the old ones. Want to get the best “Bang for your buck”? Data recovery can cost thousands. Don't risk losing family photos, financial data, business information. Now more than ever it pays to protect your data. Ask JWD TECH about the many options available. Apple Certified Desktop Technician, Laptop Technician, Help Desk Specialist, Apple Certified Support Professional 10.7, Apple Certified Technical Coordinator 10.7 and the Mobility Technical Competency of the Apple Consultants Network program. JWD TECH provides full-service troubleshooting and support of MacOS® based PCs and more. We can help you pick out a new MacOS® or Windows PC that will suit you, your small business, or family the best. Task oriented training and training materials. iPod, iPhone, and iPad® training and support - Let us put your CD collection onto your iPod®.